I have a space in my house where I light a candle if I know of a woman in labour who needs thoughts and support. If my boys see a candle lit there, they will ask after the woman and her baby, and we will often send thoughts and love to them as we sit down to eat. In class we talk about lighting candles, and very often a woman will send a text or e-mail to her friends from the classes when she goes into labour, and they will light candles for each other. 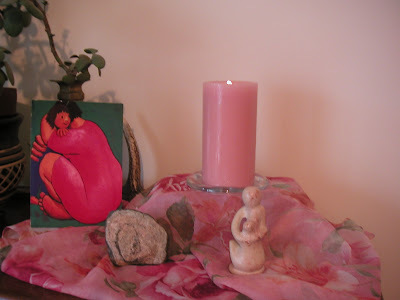 The act of lighting a candle focuses our attention and awareness on our friend's labour, and allows us to bring a physical representation of our support and solidarity into our homes. Many women have said that they thought of the candles burning for them in their friends houses, and that it gave them strength and comfort in labour. Despite contractions building up yesterday they stopped shortly after midnight. Tandi was able to get some rest, and they will try again this morning. Please can everyone spare a few thoughts For Tandi, Dan, and their baby boy. They went up to Bristol this morning, and at the time of writing this, she had had prostin about 3 hours ago, but apart from a few niggles, not a lot happening. She has been in regular contact via text today, so I will post again if I get updated. They have got a mountain to climb, and Tandi knows that she has the thoughts of all the women she has been at class with, and all their support behind her. If you get a moment over the next few hours and days, please just send your positive thoughts to her, imagine how relieved you will feel when you hear how well they are both doing, and think of how honoured we will all be when we finally get to meet her strong little boy. I have lit a candle for them, and will continue to do so whilst I am at home and able, until I hear that they are both safe and well. Their little boy has so many obstacles to overcome, I am sure we can all find a little space in our thoughts for him. If you want to send messages to Tandi and Dan, please leave them as a comment to this post and I will pass them on.